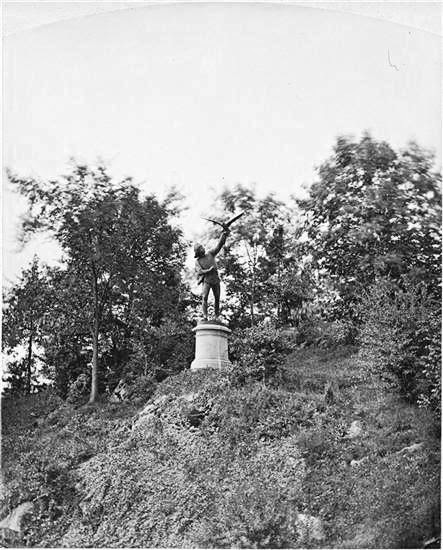 In 1875, two years after Central Park was officially completed, British sculptor George Blackall Simonds exhibited his The Falconer at the Royal Academy Exhibition. Simonds was the son of a wealthy family of British brewers; but he was currently living in Rome. His statue, which was intended for Trieste, Italy, was seen by George Kemp. The New York merchant was impressed. Born in Ireland, Kemp had made a fortune in New York and he approached the artist about reproducing the bronze as a gift to Central Park. Simonds had a second statue cast by Clemente Papi of Florence, Italy, using the lost-wax method which the artist preferred. The rapid-fire chain of events resulted in The Falconer being nearly ready to unveil only a few months later. On May 22, 1875 Frederick Law Olmsted inspected the park with the Park Commissioners. 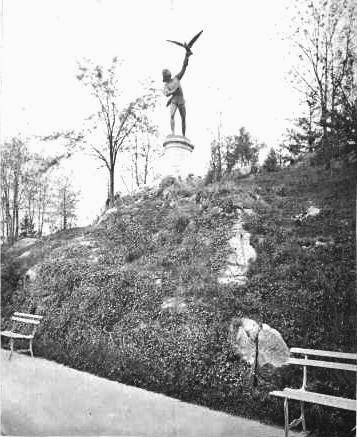 “The lake, walks, drives, rambles, and other features of the landscape were viewed in turn, after which the party proceeded to the site of the new statue of ‘The Falconer,’ near the south bay of the lake,” reported The New York Times the following day. Sixty years after the statue’s unveiling natural growth had nearly obscured it. In 1937 the entire monument was dangerously close to toppling over. The Parks Department shored it up and repatined the bronze. But 1930s taste in art did not fare well for the piece either. On January 17, 1937 Ruth Green Harris got a critical jab in as she described “the sculptural mélange that is Central Park” in an article for The New York Times. “Those who know their park can find the ‘Falconer’ a little northwest, on a rise above the path, almost hidden among the trees. It is advisable to remain standing on the Esplanade and to look at the memory of this engaging boy rather than at the bronze itself, for critical examination might destroy a shrine." It was not critical examination that nearly destroyed the statue; but malicious vandalism. In 1957 the falcon was sawed off and stolen. A new falcon was cast and reattached. But that, too, would not last. The 1970s were a dark period in New York City. As the city teetered on the brink of bankruptcy, crime was at an all-time high and Central Park became synonymous with muggings and rapes. Monuments and statues were defiled by unrestrained vandals. The much abused sculpture was resurrected in 1982. A new arm and falcon were cast and attached and the restored statue was reinstalled in the park. In 1995 The Falconer was again conserved and repatined. Was it reinstalled in the same place or a new location? It's back in the same place. Very beautiful and I think the lofty location is magnificent, but the repaired arm and falcon look very different from the old photo, more arm extension horizontally than vertically and the birds perch seems different too. Did they alter the missing pieces? There do appear to be slight differences. Since the art and falcon were lost, I assume they were reproduced using photographs; so variations would be expected.